The legendary lawsuit waged between Captain Marvel of Fawcett Publications and the Superman folks over at Detective Comics, which ultimately put the Captain out of the print business, was a bit ahead of my time. Yet thanks to a smart trade, I did have one of his early comics in my collection (regrettably long gone—Thanks, Mom!) that showcased not only Cap, but Mary Marvel and Captain Marvel Jr. as well. At the time I remember not being terribly impressed by the character, viewing him as a sort of anemic Superman clone and, to be honest, couldn’t have cared less that a few lawyers, rather than some diabolical fiend, had curtailed his crime-fighting career. I suppose lots of people agreed with me on this issue (even though in his heyday he was outselling The Man of Steel) and as Superman’s fame grew into something more substantial than merely a pulp character, his exploits explored beyond comics in film, radio and television, the schism between the two heroes grew wider and more pronounced. The one area, however, where Captain Marvel had it all over Krypton’s favorite son was on the screen. 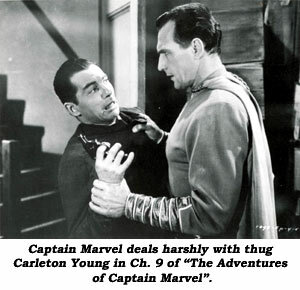 While Columbia’s two Superman serials, produced in the late ‘40s, did well at the box office and were occasionally entertaining in a crude sort of way, Republic’s 1941 effort “Adventures of Captain Marvel” is considered by many serial aficionados to be one of the greatest (if not the greatest) serials ever produced. And there’s much to support this view. Unlike the original WHIZ comic book origin of the character where Billy Batson first turns into Captain Marvel in a New York subway, he’s depicted here as the junior member of a scientific expedition visiting Siam in search of facts about the ancient Scorpion Dynasty. 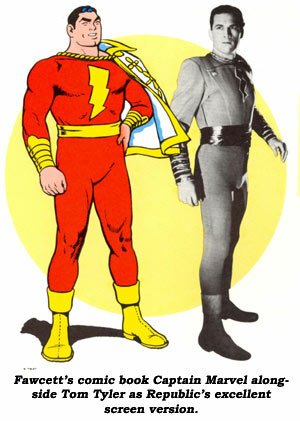 Accidentally separated from his fellow explorers in a tomb, young Batson is confronted by Shazam, the holy shrine’s guardian, who bestows upon him the magical powers to transform into Captain Marvel whenever he utters the word “Shazam”. For the rest of the serial, Billy/Captain Marvel makes it his business to protect the expedition—who have uncovered The Scorpion, a dangerously powerful weapon consisting of five lenses which are divided between the group—from the hooded Scorpion and his henchmen who also seek the incredible device. One of the prime reasons Captain Marvel stands out as a serial character, at least for me, is his absolutely unpolluted commitment to deal with his adversaries in the most no-nonsense and direct manner possible. This is one good guy you just didn’t get many second chances to tangle with, not once he had his mitts on you. As portrayed by Tom Tyler, a champion weightlifter whose other screen credits included playing “The Phantom”, the Mummy and numerous cowboy heroes, Marvel disposes of villains like a hungry great-white going after tuna and with just about as much soul searching. Whereas Kirk Alyn’s Superman is a bit of a smug bully boy, Tyler’s Captain Marvel is an angry, steely-eyed avenger with no patience for society’s wrongdoers. His motto is eradication and that’s just what he does. Whether machine gunning a retreating group of desert tribesman or systematically hurling assorted baddies off a skyscraper roof, Captain Marvel is all business. Tyler has little dialog to work with—in fact, his weakest moments come when he has to appear human and converse—but the actor looks great in his tights and when doling out punishment possesses a nasty countenance which served him well as Kharis in the “The Mummy’s Hand”. 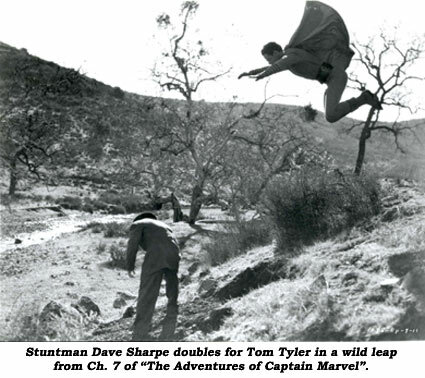 Stuntman extraordinaire Dave Sharpe handled all the excessive physical demands with great leaps and landings and were it not for Sharpe’s bushy hair which contrasts with Tyler’s slicked back locks, it would be hard to spot the difference. Particularly effective are the shots of the Lydecker brothers’ amazing Captain Marvel dummy flying over the landscape, beautifully integrated with the takeoffs and landings of Tyler/Sharpe. For kids in the ‘40s, and to a degree even today, these images were the things which dreams are made of. The supporting cast is equally satisfying. 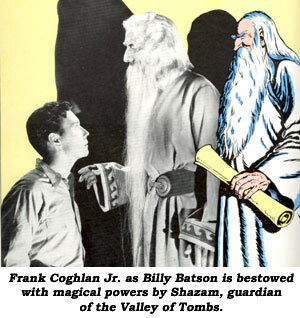 Frank Coghlan makes an energetic and earnest Billy Batson and the usual stable of Republic players led by familiars Robert Strange, Kenne Duncan, John Davidson, Jack Mulhall and George Pembroke are all good. Louise Currie is a spunky and attractive heroine. Reed Hadley, a year after portraying the masked man in “Zorro’s Fighting Legion”, shows up as a local tribesman. 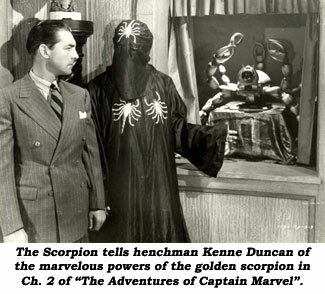 Gerald Mohr (or at least his menacing voice) as The Scorpion is a worthy foe for the Captain and Billy Benedict in his signature role as the hero’s youthful sidekick (of course named “Whitey”) is always enjoyable. If you’re a serial fan there is little in this production to fault. Co-directors William Witney and John English were never better at choreographing their action or in creating atmosphere and tension, even when you knew Captain Marvel would surely find a way out of his dilemmas. It’s wonderfully paced, photographed and scored and the stunts are terrifically crafted. For slam-bang, relentless, unpunctuated action and thrills, this is a must see. Aside from the wide variety of exciting cliffhanger situations it delivers, it also has, thanks to footage lifted from several other big-budget films cleverly slipped into the action, a larger and more lavish look than most serials. 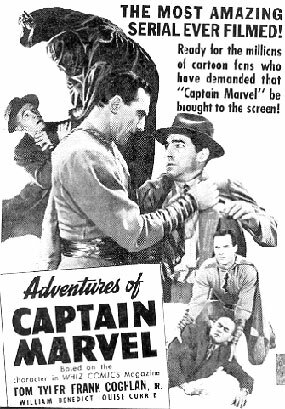 After 60 years, “Adventures of Captain Marvel” is still a treasure. As was William Witney. In Ch. 9 of “Blackhawk” (‘52 Columbia) a police APB goes out for Pierce Lyden whose name in the serial is Dyke, but the police ticker tape (in obvious stock footage) reads George T. Norton. Apparently, producer Sam Katzman thought nobody would catch the difference. 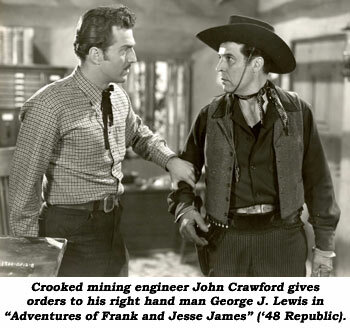 One of the earliest roles John Crawford appeared in was as the heavy Amos Ramsey in “Adventures of Jesse and Frank James” (‘48). John’s Aunt Kitty was married to the cousin of Yakima Canutt who co-directed that serial as well as Republic’s two previous serials in which John also had roles, “G-Men Never Forget” and “Dangers of the Canadian Mounted”. She told John he should go by and see if Yak could help him get into the business. “Yak said, ‘Well, Crawford, you can handle dialogue okay. 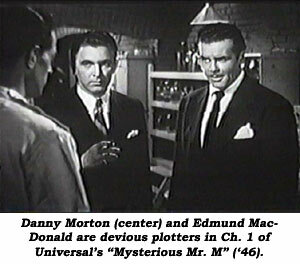 Now you better work on your action.’ The first time I ever did a screen fight was with Clayton Moore. Screen fights are the antithesis of fighting. If I’m going to hit you it’s like me throwing a baseball in that direction. I move across and you snap your head back and it looks like I really pasted you. Clayton said, ‘Have you ever done one of these?’ I said, ‘No.’ He said, ‘Take a swing at me’ and he felt the wind go by him. He said, ‘Oh no. Let’s get behind the flats.’ He then said, ‘You don’t have to come any closer than this’ (measuring a good distance) and I’ve never forgotten that. So we worked on it and I got pretty good. In fact, I began to teach other actors how to do that (including James Garner and “Annie Oakley”’s Brad Johnson). “Adventures of Frank and Jesse James” was just one of John’s dozen serials at Republic and Columbia. In Ch. 1 of “Secret Agent X-9” (‘37 Universal) X-9 (Scott Kolk), in a speedboat, is pursued by gangsters in another speedboat. Suddenly one of the gangsters reels from a shot, but X-9 has not been firing back at them.